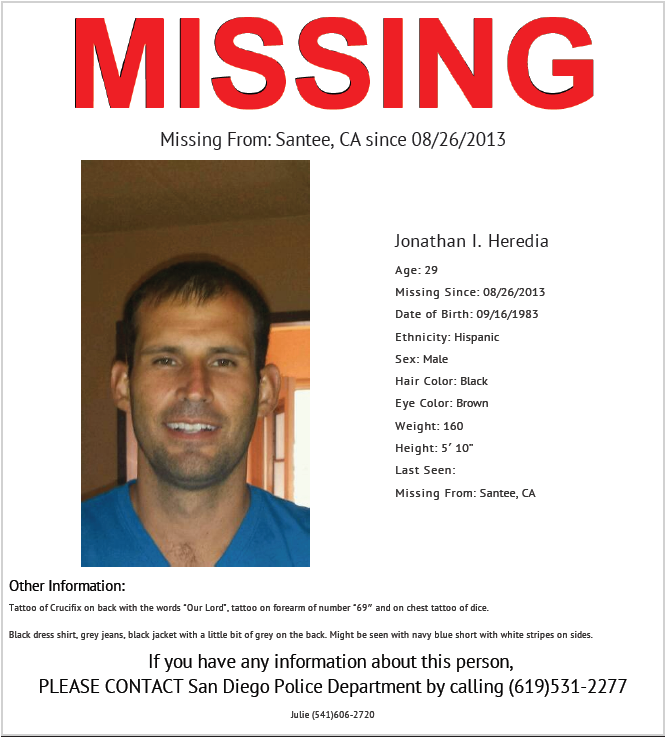 UPDATE 9/3/13 – Jonathan’s mother contacted us and said her son was home. My son is safe in home thanks soo much for your help. Previous story: The San Diego County Sheriff’s Dept. is the lead on this case not the SDPD, per the Sheriff’s PIO statement on Friday. The Sheriff Dept. stated they will pass out the flyers. Jonathan was waiting for his mom to take him to fill an application and while she finished up brunch, he walked outside. And when she went to look for him he was gone. The family went to the city and he never went to the place he was to apply it. Jonathan has been several depressed and was diagnosed with Schizophrenia at the age of 21. He was in a mental hospital for 6 years without using medication and was discharged because his evaluations showed he “didn’t have a mental illness. He may be wearing a black dress shirt, grey jeans, black jacket with a little bit of grey on the back, or navy blue shorts with white stripe on the sides. If you have seen him please contact the police or leave a message here.